A special edition model of the Mazda MX-5 has made its debut - with 600 set to make their way to the UK, priced from £28,095. Mazda will sell 3000 of its MX-5 30th Anniversary Edition globally, all finished in unique Racing Orange paint and featuring bespoke Rays alloy wheels developed exclusively for the MX-5. 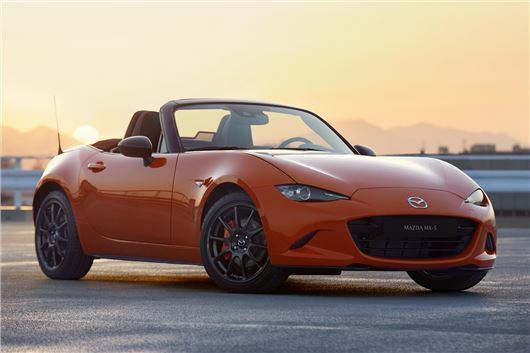 Based on the 2019 Mazda MX-5 2.0-litre petrol with 184PS, the 30th Anniversary has a six-speed manual gearbox, Bilstein dampers, strut-brace and limited slip differential. Other highlights include orange brake calipers and Brembo front brakes - a first for UK-spec MX-5. Inside, there are Recaro seats with orange accents along with Alcantara on the door trim and instrument panel. Apple CarPlay and Android Auto are standard on the 30th Anniversary model. “In the three decades since the launch of the original model over 130,000 Mazda MX-5 have been sold in the UK," said Mazda UK's managing director, Jeremy Thomson. "This is a sports car that has resonated with enthusiastic British drivers ever since its debut and four generations on it’s as popular as ever." There'll be 400 MX-5 30th Anniversary Edition convertibles sold in the UK, priced at £28,095. A total of 200 RFs will be sold, priced at £29,895. Available to order now, the first UK customer deliveries will begin in the summer. Much as I like the Mazda MX5 ( had Three all Mk3's ) still have one. I cannot bring myself to look at the latest Mk4 with any degree of longing, either to look at or to sit in and drive. Sure it looks up to date but the class of swoopy lines and sharp angles do nothing for me and the desire to save weight has lead me to consider that costs were made in doing so. For me the cabin is cramped unlike the Mk3's , there are no door cappings only paint which I am sure with females wearing rings and guys with big watches will soon scratch and look cheap. The top edge of the windscreen is back towards the driver so close that it reminded me of the MG Midget where everything was cramped along with the sunshades being at just the right level ( for me anyway ) to hit me square in the middle of my forehead. With all the Mk3's I could see where the wheel arches are and gauge accordingly as with the length of the bonnet, the Mk4 I could not see the edge of the wheel arch and the bonnet made me reminisce of the Ferrari Daytona where you could see the first two feet after that it drooped out of sight and was subject to guesswork when coming close to anything.